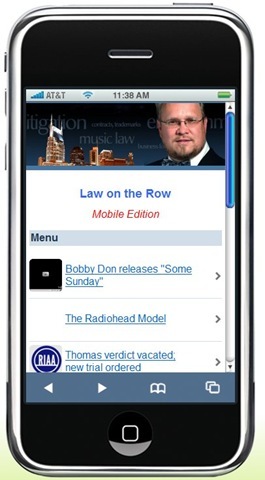 Music Row Law goes mobile! For those re aders sporting new iPhones, Blackberrys, Windows Mobile smartphones or even for those diehard Palm fans who own Treos, Law on the Row is extremely pleased to announce that it is going mobile! The new mobile version loads faster on smaller devices with more limited web browsers. Just type in the following URL on your mobile device: http://lawontherow.mofuse.mobi. You enjoy the same great content, without some of the photos and links. It’s a great way to keep up with articles on the road. Enjoy! By the way, for fellow bloggers, you can create your own mobile website using your RSS feed at www.mofuse.com. Bobby Don releases "Some Sunday"
Your Place or Mine Digital operates a multitrack portable digital studio, with mix down and mastering capabilities which Ric can set up at any location. Ric’s relationship with Bobby Don dates back to 1990 when he was the studio manager and chief engineer for the famous Denny Music Group in Nashville. The duo decided to take the day off and go fishing on the Piney River when Bobby Don’s recording session was preempted by an emergency session for Allison Kraus. The two have been friends ever since. Bobby Don wrote Some Sunday as a retrospective on lessons that should have been learned from past wars, especially Vietnam, and to bemoan the hope of a quick end to the current conflict in Iraq. Bobby Don served in the Navy during Vietnam and knows all too well the pain and loss that goes with the atrocity of war as an eye witness. Since it’s release a year ago, Radiohead‘s online experiment with “pay-what-you-like” marketing has been blogged about, critiqued, and otherwise widely referenced as a viable model of marketing music in the Internet era. Earlier this month, Radiohead’s publishing company, Warner/Chappell, released a report that sheds light on the sales figures for In Rainbows. The report was released in conjunction with a presentation by Jane Dyball, head of business affairs at Warner/Chappell, at the You are in Control conference at Reykjavik, Iceland. For those of you who have been in a closet, Radiohead released the In Rainbows album on the Internet and asked those who downloaded it to pay whatever they like, even nothing if they so chose. The Warner/Chappell report indicates that collectively there were three million purchases of In Rainbows this past year, including digital sales through the band’s webstore in the run up to the album’s release, deluxe two-volume discboxes and, the physical CD sold through other digital outlets. More specifically, the band moved around 100,000 of those (very nice!) discboxes, and the physical CD has sold 1.75 million units to date worldwide. Sales via iTunes racked up to approximately 30,000 copies during the set’s first week of availability in June, making it the No. 1 album in the store that week. All of this despite the fact that the album also proliferated BitTorrent almost immediately after its online debut. The report dubbed the Radiohead Model a success. In fact, the In Rainbows album is said to have generated more money in the three-month period prior to the physical release than the total amount of money generated by their 2003 album, Hail to the Thief, which was released via more traditional outlets. Not only did the Radiohead Model prove successful for generating a buzz about the band, allow the band to obtain distribution and and sell physical product, it also enabled Radiohead to sell over 1.2 million tickets in their supporting tour. The Radiohead Model is certainly a viable option for mid-level bands seeking to do their own thing via the Internet, but can it work for a small band seeking to break? Many in the industry will continue to maintain that a successful entertainment act will need the marketing support of a major record label in order to achieve sales in the range of Radiohead. Others will argue that success can be achieved by selectively marketing and generating the type of viral support that can be generated on the Internet through independent marketing and distribution networks. There is no doubt that major labels have the resources to almost instantly catapult an act to stardom. There is also no doubt that a few independent acts have achieved a high level of success without the assistance of the majors. As with most issues, there is probably a compromise solution here somewhere. And in that solution probably lies the future of the music industry. The major labels are starting to adjust to the whims and wills of the populace. But it’s a difficult task to turn the Titanic. In the interim, the opportunities arise for the independent entrepreneurs to step in an take up the slack. It is an exciting time to be part of the industry, even with all of its ebb and flow. New winds are still blowing and the sands are still shifting. Whatever the surviving landscape will look like, the Radiohead Model is one clue to its terrain.